Despite the lack of a new contract, NFL Defensive Player of the Year James Harrison will be present as the Steelers begin their offseason workout program on Monday, agent Bill Parise said. Parise added that both sides are far apart but sounded hopeful that a deal would be struck. Call me a pessimist, but I just don't see this having a happy ending. That's just a total shot in the dark from my point of view based on nothing but pure speculation. With the defensive bar being set unrealistically high by Washington's recent signing of Albert Haynesworth, I don't feel that Dan Rooney will ultimately pay someone based on an iffy decision Dan Snyder made, which is what it boils down to. Would Harrison have success with another team? Probably. But would he have success at a Defensive Player of the Year level? That's a different story still open for debate. Don't forget, as hard as it is to believe, Harrison is already 30 years old. True, he doesn't have the mileage as the usual 30-year-old, starting 39 games in his career; but still, 30 is 30, and don't think for a second that the Steelers won't use that against Harrison in negotiations. Don't get me wrong - I would love to see #92 finish his career in the Black and Gold. 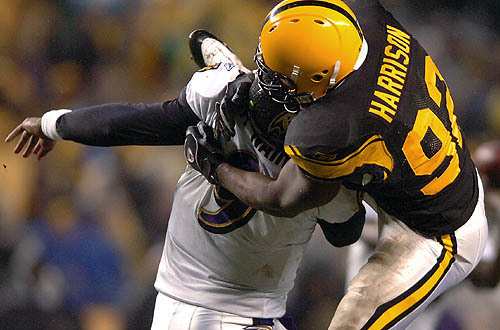 But based on what the market will bear and the traditional decision-making of the Steelers in situations like this, I wouldn't be surprised to see Harrison playing somewhere else in 2010. Yep, this won't end the way we would like it too. Just at the LB position: If the Steelers could let Chad Brown go when he was hitting his prime, and then let a team leader like Joey Porter go when he still had some good football left in him, then they will let Harrison walk as well. Business is business. Unfortunately, he will be gone. Sorry to say but that is how the Steelers roll. so much pessimism! have faith! Your pessimistic logic makes sense, but I just don't want to think about it. He's to much fun to watch. Reread what Santo wrote. Think of all the OLB's the Steelers have had success with. Lloyd, Porter, Harrison... Yes, they were all good LBs, but its the system that made them pro bowlers. Harrison is a great LB, but, as you mentioned, its the system that makes him the DPOY, not just his skillset. If they let him go, they'll find a replacement to do just as well. Hell, maybe even Timmons can jump in the role.